Toronto officials know this wasn’t necessarily the plan. They can admit the team’s surge toward the top of the East, perhaps the league’s sweetest story this season, is partly a happy accident. Flipping Rudy Gay to Sacramento a year ago was Step 1 of a potential tank job. Dangling Kyle Lowry in front of the Knicks, Warriors, and other teams was Step 2. Those teams waffled at paying Toronto’s price, and amid the waffling, the leftover Raptors became a team. Lowry agrees. “Not in my wildest dreams,” he says. Toronto now finds itself at another sort of crossroads, one several contenders will face as we approach the trade deadline of what appears to be a wide-open NBA season. Teams under the new collective bargaining agreement have hoarded first-round picks around the deadline; finding bang-for-the-buck contracts has been crucial under a harsh luxury-tax regime, and cost-controlled rookie deals are among the best means of doing that. Tossing away future first-round picks with light protections and swap rights can come back to haunt you — ask the Nets, Heat,1 Knicks, Pistons, Kings, Clippers, and others who dealt future assets without hedging against a downturn. But dealing a pick you know will end up in the 20s in the very next draft is different. The pain is minimal and passes fast. A number of teams — Portland, Memphis,2 Toronto, Washington, Oklahoma City (hello, Dion Waiters!) and others — will think hard about sacrificing a small piece of the future to chase that one extra veteran who might nudge them up the league’s hierarchy today. The East is open for Toronto. Cleveland is struggling, and the surging Bulls are crossing their fingers that Joakim Noah and Derrick Rose can reach peak health and peak production levels at the same time. Atlanta and Washington have to prove their playoff chops — just like the Drakes. The Raptors are an offensive powerhouse with a leaky defense in the weaker conference. They have to decide what that means — how far they could go, whether they would be anything more than sacrificial roadkill in the Finals, and how much they might pay to find out. The Raps have an extra first-round pick in the bag (thanks, Knicks! ), a bunch of midlevel expiring contracts to throw around, and a close relationship with one team — the Nuggets — that appears to be nearing the realization it cannot make the playoffs this season, per several league sources. Would the Raptors deal their first-rounder in exchange for someone who could help today — an extra dose of rim protection for a bottom-10 defense, a hybrid forward, or some scoring juice to slot ahead of Amir Johnson at power forward? We know the Raptors are good. They ranked in the top 10 both offensively and defensively after the Gay trade last season, and they’re now chasing the beautiful Mavs machine for the no. 1 spot in points per possession. But there is skepticism about how good they really are, and getting pasted in Phoenix and Golden State to round out an otherwise strong West Coast road trip didn’t help. That skepticism may stem from Toronto having rejected some of the stylistic trends that swept the league over the last few years on both ends of the floor. Most elite offenses conjure a snapshot that explains why they are so deadly: Steve Nash and Amar’e Stoudemire running a pick-and-roll, surrounded by shooters; Tyson Chandler slicing down the lane with Dirk Nowitzki spotting up; San Antonio pinging the ball; LeBron posting up as a small-ball power forward in Miami. Try that exercise for Toronto. It’s hard! Everyone wants to copy the Spurs, but the Raptors rank 29th in assist rate and 27th in passes per game. Only the Lakers jack more pull-up jumpers — those off-the-dribble jobs that are among the lowest-percentage shots in the game. Lowry and Louis Williams are dangerous pull-up shooters, especially from deep, and both have learned to use the threat of their pull-up to draw fouls and get in the lane. Defenders know that Lowry and Williams might shoot off the bounce at any moment, and both leverage that fear with killer pump fakes and hesitation dribbles that stand defenders straight up. From there, it’s either a shooting foul or an easy driving lane. The offense will sustain; it has done so without DeRozan. The other side is what matters — now and going forward. If you can’t use a screen, you can’t shift the ball from one side of the floor to the other or gash the middle of the court — stuff that forces defenses to scramble. The Raptors (mostly) don’t play like that. They’re happy to let you use picks, even if that strategy yields the middle. Toronto volunteers itself into help situations. Its defense is one big wager: You’re going to make us rotate, and we’re going to do it better than you think. It’s a dangerous game, one that requires precise five-man synchronization. No one can be a half-second late on a rotation, shift over to the wrong offensive player, blow a closeout, or gamble his way out of the play. Lowry’s defense has predictably suffered without DeRozan around to share the scoring burden, and DeRozan’s absence has forced Toronto to overplay the Williams/Vasquez combination — and the undersize Lowry/Williams/Vasquez trio. 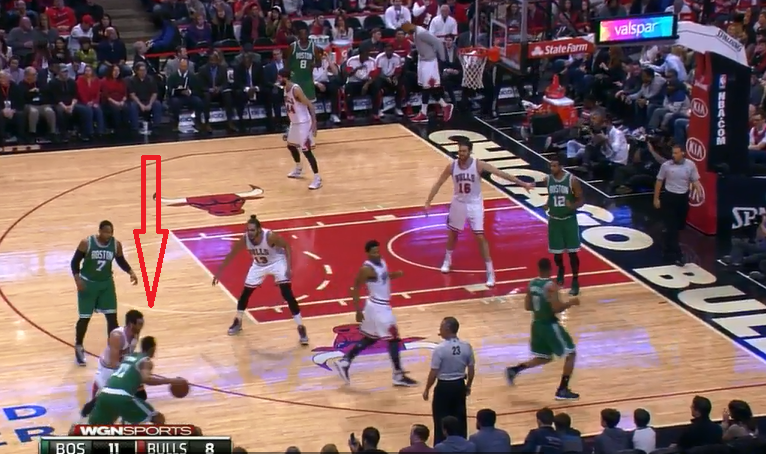 Once Butler gets around the pick, he and Noah are effectively working a 2-on-1 against Valanciunas. Since Chicago has cleared away its three other players, there is no natural help defender; any help must come from shooters in Butler’s direct line of sight. There is no magic to transforming that open 3 into a contested one, or preventing it from materializing. Everyone just has to be an inch or a foot better at their job. The defender scurrying over the pick has to make it through clean — Casey calls this “getting skinny” or treating the pick “like a hot stove” — and stay on the ball handler’s hip. The big man guarding the screener has to hit just the right spot — not so far up5 as to be vulnerable to a blow-by, but not so far back that the ball handler can prod deep into the defense. The Raps are confident they’ll get better with effort and experience. Terrence Ross is still finding his way both on and off the ball. Valanciunas is improving as a rim protector, but it comes in fits and starts; the game still looks too fast for him at times. Amir Johnson is a stabilizer, but he’s had problems changing direction while dealing with a balky ankle. The team already alters its general scheme for specific matchups, and Casey says they’ll do more of that in the playoffs. The Raps have their eyes on more than a fluky one-year run; whatever issues they have now will only grow more dire if the East improves. “Who’s to say the East won’t be incredible in three years?” Ujiri says. Williams and Amir Johnson are both free agents this summer, and it’s not safe to assume either will be back. The Raptors essentially have a choice: Re-sign both, or renounce their Bird rights (which carry cap holds totaling near $21 million combined, obliterating all Toronto’s room) and chase a free agent — Paul Millsap, Jimmy Butler, and Draymond Green come to mind — with cap space. Bringing back just one would leave the Raptors with something between $8 million and $10 million in space — not enough to attract a star with the league swimming in cap room and handing out fat deals in anticipation of new TV revenue. Bring back both Amir Johnson and Williams at market value and the Raps would have trouble carving out max-level cap room in the summer of 2016 — when Kevin Durant and a ton of other stars will hit the market. Valanciunas and Ross will be free agents that summer, and their cap holds would soak up a ton of Toronto’s potential space.6 Williams especially seems like a luxury, with a bunch of other capable ball handlers under contract beyond this season. Players on other teams have taken note of the fan support. The All-Star Game is coming to Toronto next season, and the organization is working to overcome the perception — internally, among fans, around the league — that it is somehow an NBA outcast. There are still some big decisions to come. You never know what might happen if you win the East and encounter some injury luck against whichever team survives the West, but the Raptors for now appear a notch below the league’s top contenders. Maybe that’s fine, considering how far the franchise has come in so short a time. Cousins proved over most of last season and the start of this one that he’s a legit two-way superstar. He committed to rampaging in the post on offense and actually trying on defense. Mike Malone reached Cousins and tailored his scheme toward the big fella’s skills — and away from his liabilities. Cousins has remained a lethal offensive fulcrum since Malone’s firing, but he has regressed into something like his old self on defense. His sulking after empty trips has Sacto playing the wrong kind of 4-on-5, and he’s back to lazily reaching into passing lanes against the pick-and-roll instead of maintaining a bouncy defensive stance. Boogie’s discontent burbled over to the offensive end in Minnesota over the weekend, when he embarrassingly loafed through an entire possession as Rudy Gay worked. Some of this has to be fatigue; Cousins is getting his wind back after a nasty bout of meningitis. But he’s acting like a miserable grump, and the Kings are suffering for it; they’re still playing worlds better on both ends with Cousins on the floor, but their defense has been a catastrophe since Malone’s firing. All of that high-minded talk of finding a “jazz conductor” to replace Malone was interesting, but it glossed over the fundamental risk Sacramento took striding into the unknown: It had found the first coach who could appease its cranky superstar and it removed him — apparently without consulting that superstar. It usually doesn’t take much film study to grasp the mechanics of a team’s defense and its philosophical underpinnings — why they are doing what they do. That is not the case on Brian Shaw’s party bus. The Nuggets hop seemingly at random from one strategy to another, except half the players don’t seem to realize they’ve changed blueprints. Against the Lakers last week, they had poor Timofey Mozgov trapping pick-and-rolls 35 feet from the rim. Mozgov is nimble for his size, but he’s not Chris Bosh, and the three Nuggets below the play had no clue how to coordinate in defending 3-on-4 until Mozgov ambled back into the paint. Denver on some nights looks as if it wants to be a Thibodeau-style team, forcing ball handlers away from screens and toward the sideline. One game later, Denver may scrap that and start blitzing in some sad attempt to imitate the peak LeBron-era Heat. There is something to be said for adjusting based on opponent, but that’s not what Shaw did as an assistant in Indiana, and it works only if every player can handle it. The Nuggets were never going to be a great defensive team, but they’re a mess now. A soft schedule has helped Detroit fly without Josh Smith, but Smith’s dismissal and the return of Jodie Meeks have allowed Stan Van Gundy to dot the floor with more shooting. Jerebko isn’t a great shooter, but he’s capable at power forward, and he gives Greg Monroe and Andre Drummond more room to work — Monroe from the post, Drummond on the pick-and-roll. Jerebko will never have Smith’s talent, but fit matters, and he rarely oversteps. And then, bam: Korver reverses course, sets a nice little pin-down screen, and frees Millsap to slip out for an open triple. Korver is a mean screener — it’s an underrated part of his game. He deserves serious All-Star consideration. Holiday’s defensive metrics are all over the place, but he has always passed the eye test as a long-limbed fly trap enveloping drives and chasing wing players. He is the rare point guard who produces regular highlights on defense. Expert drivers try to juke him one-on-one, only to watch Holiday slide right along with them until they crash into his chest or fall victim to a pickpocketing. He has the closing speed to swat 3-pointers like a mini-Brow. Knowing he can do that is dangerous; Holiday often drifts an extra step away from a sniper, even in the near corner, confident he can recover in time. He gets toasted that way now and then, but it’s a thrilling ride for viewers. Bennett is just 21, still something like a rookie after logging 663 minutes in Cleveland amid a deluge of injuries and medical issues. But Bennett doesn’t do much of anything during his brief stints with Minnesota’s sad second unit; he exists to miss 20-foot jumpers, play awful defense, and return to the bench. Bennett has taken five 3s all season after entering the league as a potential pick-and-pop big. That’s not necessarily a bad thing; he shot just 13-of-53 from deep last season, and he literally couldn’t see straight. But he hasn’t replaced those triples with shots around the rim that might earn him some free throws and, you know, go in the basket. A full 54 percent of Bennett’s shots have been long 2-point jumpers. Even Dirk Nowitzki and LaMarcus Aldridge think that’s excessive. Bennett has canned just 37 percent of those upchucks, not nearly enough to justify the volume. He’s constantly late rotating to the rim on help defense. On some possessions, an opponent dunks before Bennett has even turned his head to see what might be happening in the basketball game behind him. Again: There’s time, and Bennett will show flashes of what made him the no. 1 pick — an emphatic pick-and-roll dunk or a canny pass. But the early signs are bad. We need a separate League Pass Alert for when Portland is down between 10 and 15 points with about three minutes to go, because that’s when Lillard is about to start bombing 30-footers off the bounce. Having a conscience is good for regular humans, but for things to get fun, Lillard must set aside basketball ethics and just start chucking the damn thing. Gasol might be the most polite person in the NBA. His Twitter account reads like a parody of what a humble person would tweet: “A great win for my friends and I today! We will continue to try our very best!” Gasol has not gotten the memo that genuine emotion is lame. First of all, points for the pun in the name. This is perhaps the best free food promotion in the league. Fans at Wiz games get a free Chick-fil-A sandwich if one visiting player goes 0-of-2 from the line on a single trip in the fourth quarter or overtime, per a Wiz spokesman. This is a great way to link the lure of free food with an event that could actually affect the game’s outcome. Most giveaways connect to some random benchmark — the home team scoring 100 points, or giving up fewer than 90 — often triggered during garbage time. That might incentivize fans to stick around, but it’s loads more fun when the game and your free food are both at stake. The Hornets have done well during Lance Stephenson’s absence, but scoring enough without Al Jefferson will be a different challenge. The team’s new starting lineup, featuring Bismack Biyombo at center with Gerald Henderson and Michael Kidd-Gilchrist on the wing, tests the lower boundaries of spacing. Run a pick-and-roll with Cody Zeller, and Biyombo’s man will clog the lane early, knowing the next help defender will have his back crashing off Henderson or MKG (playing his tail off since returning from injury, by the way). This starting five has managed just 94.2 points per 100 possessions, and it will struggle to squeeze out points. Remember that pick they tossed Cleveland in the 2010 LeBron sign-and-trade? The Grizz are more likely to dangle a future first-rounder, having already traded away a protected 2015 first-round pick to the Cavaliers. This is more effective with Amir Johnson setting picks than with Jonas Valanciunas, who is still learning the timing of pick-and-roll play; Valanciunas has attempted just 28 shots out of the pick-and-roll all season, per Synergy Sports. This depends, of course, on the identity of both that defender and the screener. Valanciunas usually drops back, though he’ll hedge now and then, especially against side pick-and-rolls. Amir Johnson mixes it up, and Patterson is a speedy hard-hedger. Most league executives are operating under the assumption the cap, currently at $63 million, will take a mega-leap to about $90 million in July 2016, though they are preparing for all contingencies.